The Great War, also known as World War I (WWI) — or the World War to those hopeful that it would be the only one — affected almost every continent and impacted millions of individuals. From Belgium to Armenia, from the United States to India, civilians and military personnel recorded their wartime experiences with detail and emotion. Transnational issues, like industrialized warfare and medical advancement, touched people on a daily basis — not only in Europe and the Western World. 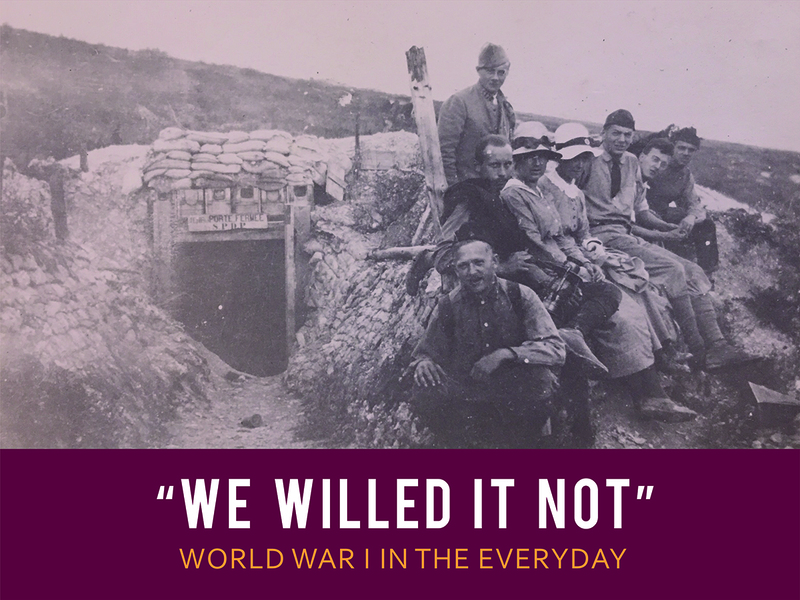 Through diaries, letters, photographs, poems, and songs, we witness how the Great War overshadowed the lives of students, farmers, homemakers, nurses, poets and politicians. As trench and submarine warfare churned once tranquil surfaces, individuals engaged in the conflict by sending supplies, prayers, loved ones and even themselves to aid the effort. Ultimately, World War I altered how modern society experienced race, class and gender. Exhibit Design: Abram Clear, SCRC Graphics Student Assistant. Fabrication and Installation: Mariaelena DiBenigno; Jennie Davy, Exhibits Manager; Sarah Olney, Digital Production Specialist; Daniil Eliseev, Colin Morgan, and Dana Florczak, Undergraduate Student Assistants. Photos of this exhibit are available at W&M Libraries on Flickr.